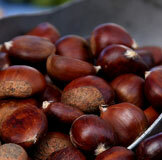 While most people associate chestnuts with a cracking fire and the warmth of the holiday season, they are highly nutritious and versatile nuts that can be enjoyed in a variety of dishes throughout the late winter and early spring. Dating back to around 2000 BC, chestnuts have been an important food for centuries, often replacing wheat and other grains in times when such foods were scarce. Because of the chestnut’s unique nutritional content, it has been rumored that a Greek army was able to survive almost exclusively on the nut during their retreat from Asia Minor in 401-399 BC. Creamy and crumbly, savory yet sweet, the chestnut boasts a very different nutritional content from its nut cousins. Unlike any other nut, chestnuts are a significant source of vitamin C. Just a small 3.5-ounce serving of chestnuts contains about 65 percent of the US recommended daily vitamin C intake, making this nut a highly potent immune booster. But it’s not just the vitamin C that makes the chestnut so unique. Unlike walnuts and almonds, which are renowned for their heart-healthy fats, chestnuts are relatively low in fats and calories, and contain a complex carbohydrate content similar to wheat, rice and potatoes. Accordingly, they are often used as a grain replacement in a variety of breads and cakes. You can chop, crumble, sauté or crush roasted chestnuts into almost any dish, including salads, muffins, pies and puddings, or simply enjoy fresh chestnuts raw for a nutritious snack similar in texture to a carrot.